Aqua aerobics is a low intensity workout that offers a multitude of benefits for everyone. In the past, many people believed that water exercises were only beneficial for the elderly or other individuals who had limited mobility and couldn't exercise in other, more conventional, ways. This has proven to be far from the truth. Swimming and other forms of aqua aerobics provide a full body workout that uses the body's own weight as resistance. Personal trainers and other fitness suggest that 3 hours a week spent performing aqua aerobics or swimming can prevent the incidence of many chronic illnesses, reduces stress and improves a person's mood. Individuals who use aquatic exercise to get and stay fit, often prefer it to other forms of exercise because it allows them to put as much or as little into it as they desire and still see some type of positive result. 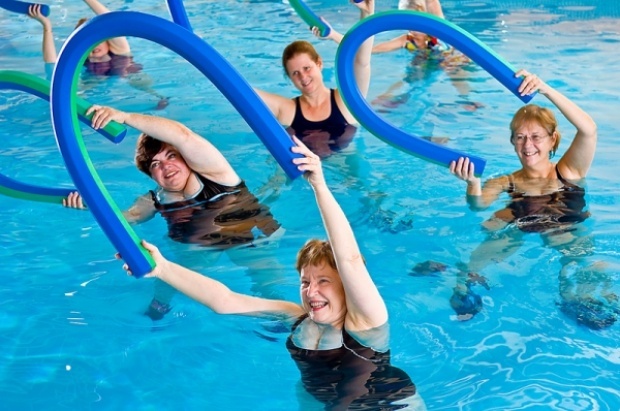 Aqua aerobics reduces the effects of chronic illness in several ways. Unlike other forms of weight bearing exercise, exercises performed in water put little to no stress on the joints or other injured areas of the body. This reduces the risk of causing inflammation and, in some cases, may actually reducing swelling if it is already present. The force of the water as it passes over the body, acts like a mild form of massage, stimulating new muscle growth and rejuvenating tissues throughout the body. Movement in the water, especially from sources like the jets of a hot tub, cause reactions within the body that can help certain types of injuries to heal. Muscle tears, joint strains and sprains are all benefited by the soothing heat and forceful motion of the water against the injured area. No matter what level of activity a person is capable of, performing aqua aerobics will provide them benefits. Simply treading water or gliding through it will provide resistance to muscles within the body. Every movement is met with mild resistance. The harder a person pushes through the water, the more resistance it is faced with. The key to the effectiveness of this type of exercise is that water uses the body's own weight to create the resistance. The force of moving the weight through the water, creates equal resistance from the water. A person cannot lift too much or strain excessively, because they are dealing only with their own body weight. Muscles weigh more than fat. This is because muscles are more dense than fat and hold less oxygen. Oxygen that enters muscle tissue is quickly used for energy or as food for the cells. Fat is what gives the body the ability to float on the surface. A person who is overweight will begin to displace fat with muscle tissue if they perform aqua aerobics on a regular basis. When they weigh themselves, they may not notice much difference in their weight. What they will notice is the definition in their body. Their muscles will begin to show more through the skin and there will be less dimpling on the thighs and other fatty areas of the body. While excess pounds will begin to disappear, a person using aqua aerobics must remember their physical strength with increase in similar proportion to their weight loss. A better way of assessing their health at that time would be to measure their loss in inches, not pounds. As the weight begins to drop and their health continues to improve, they will also notice a distinct improvement in the way they breathe. Breathing will be easier and they will not lose their breath as quickly when they are in stressful situations or performing rigorous activity. Individuals who were only capable of performing aqua aerobics in the beginning, may be able to move onto other types of physical exercise outside of the water after a few months. The increase in range of motion and improved flexibility will give those who have illnesses such as rheumatoid arthritis the ability to be more active. When aqua aerobics are used in conjunction with other healthy lifestyle changes, the benefits can be life altering. A healthy diet, adequate amounts of rest, relaxation techniques and a positive outlook all work together to bring about good health. Once a routine has been established and aqua aerobics is a regular part of a person's normal workout routine, maintaining good health becomes a habit and not a chore.